What are the big spenders going to see? Will the fight live up to the five year build up? What will these two future hall of famers have to do to meet expectations? Will it be a Zale vs Graziano, Robinson vs Lamotta, Ali vs Frazier, Hagler vs Hearns, or Gatti vs Ward? Who will be victorious? How will it be accomplished? Will it be by wits and guile, or power and grit? I am old enough to have seen Ali vs Frazier 1, and in my humble opinion it’s pretty hard to top that one. You had two undefeated world heavyweight champs matched against each other. Everyone who was anyone was present. Ordinary fans like me scrambled to get a ticket for the closed circuit telecast. Today, we have the social media, so every little nuance is instantaneously sent around the world by anyone so inclined with the press of a key. Can you say hashtag! The scales are tipped toward the master, the wizard Floyd Mayweather, Jr., at least that’s what most experts and the odds makers think. The experts know Floyd has the ability to make very good fighters look ordinary. Initially his opponents have limited success, and those wanting to see him taste defeat are encouraged. However, after a few rounds, the momentum gradually turns in Money’s favor. More and more Money gauges his opponent’s timing, and he starts landing sharp, precise punches. Soon it becomes obvious, he has once again figured out his adversary and the destruction process begins. Money doesn’t jump in with a wrecking ball attack. He’s more like a master butcher deftly using a knife and cleaver. First a slice here, a slice there, and then the heavier blows are delivered with the broad blade. With dexterity and skill the meat is chopped apart. Repeat the procedure forty-seven times and you’ve got his record. Money argues hard that he is the best ever (TBE), even better than Sugar Ray Robinson and Muhammad Ali! Bold talk for someone who has fought only 47 times, and never as often or against the kind of competition Sugar faced. Fighters like Carmen Basilio, Jake LaMotta, Gene Fullmer, Randy Turpin, and on and on. Also, there weren’t so many weight divisions and meaningless belts. Ali might not have been as skilled or technical as Money, but that was part of his charm. He was so gifted physically that he could do things fighters weren’t supposed to be able to do. He got away with it. In his prime, he was beautiful (not a pretty boy). He was unmatched with speed, both hand and foot, punching accuracy, and toughness. There were no secret training sessions with him. He invited you to see him show off, even when sparring. Like Money he was a braggart. Fans tired of hearing him declare, “I’m the greatest!” But, he said it with a mischievous twinkle in his eye, and no profanity. Still, many lined up to see him get his lip buttoned, as Archie Moore purposed. Ali is still the best known fighter in the world. Everyone knows who Muhammad Ali is, and that’s due to his personality, his wit and charm. He also had Liston, Frazier, Patterson, Norton, Foreman, Chuvalo, Quarry and many others. Money is mainly known for his ostentatious life style. When is the last time he met with a world leader? He never won the Gold like Ali, and he should be grateful for the popularity of opponents, because that popularity is responsible for a big part of his income. True boxing fans recognize and appreciate Money’s superior skill, but beyond that he mainly appeals to the young and the childish envy of his expensive cars, clothes and paid entourage he calls the Money Team. Pacman goes about it in a little different manner. He is confident, but he let’s others decide where his place in history will be. His way of fighting is more violent, even reckless if you want to take Money’s word for it. Pacman doesn’t slice and dice. He is more app to use a hammer in machine gun fashion to tenderize his opponents. He overwhelms them, raining blows from all directions. There’s no cover, no where for them to hide. Opponents swear Manny is using a sledgehammer to bludgeon them with. No matter how hard they try to slip, block and parry, they just can’t stop the onslaught. Those who avoid being knocked out, and are too brave for their own good, are fortunate to have someone in their corner act for them and throw in the towel. Money is best known for his defense and beautiful counters. He drops his chin behind his left shoulder. He bends to his right and back (shoulder roll), with the left arm at a right angle protecting his body. His right glove and arm are used to provide cover for blows aimed at his chin. When punches come in bunches, he turns and pivots, and if that isn’t enough, he ducks and bobs and weaves under them. He uses the snap away any time he chooses, coming back with a sizzling right hand. If the punch gets the desired effect, and it usually does, he will shoot through with another and another. Pacman relies on speed and power. He has dynamite in both hands and delivers explosive bombs in the form of hard jabs, right hooks and straight lefts. He is accomplished at threading the needle, going around it, or blasting through it. He relishes exchanges, confident that he will get the better of it. He invites them, pounding his gloves together and nodding his head in eagerness to engage. Manny loves to study the Good Book, and In a biblical sense, he’s looking to “smite” them (opponents). Usually his opponents think better of trading with him and try to box. That of course means they try to create some space. Most don’t have the legs for it. That’s the gift that hasn’t been mentioned yet. Both Money and Manny have great sets of wheels, and all of their other gifts are dependent upon their quick feet. Floyd is accused of running, but that’s not true. He doesn’t run around like say a Chris Algieri. Rather, he moves strategically, and just enough to avoid being hit, but not so far away that he can’t quickly move back in to counter. That is key. Also, he doesn’t want to waste energy. His quick feet enable him to step in or to the side of his man in such a manner that he negates their ability to punch. His repositioning causes them to turn into his blows. His knuckle sandwiches thereby become turbo charged, because they smash in unseen landing with precision, speed and accuracy. Manny’s footwork comes in a large part from his Popeye calves. When the bell rings he moves out from his corner with a basic look, gloves high, and from the southpaw side. Nothing to fear. Then he seems to vibrate from his feet to his head, bobbing side to side and then bam his opponent is hit, and the poor guy wonders where the hell the blow(s) came from? But, before he can come up with an answer, Manny hits him three more times from a different angle. Hurt and upset, the opponent swings in retaliation, but Manny’s gone. The fighter feels foolish, hurt, and he tries to regroup, but the shelling has just begun. The truth is if the great legs and quick feet were taken away from either fighter, It’ would be like cutting off Samson’s hair. Their strength would be gone. The enemy (Philistines) would be able to corner Money and pummel him, and they wouldn’t be fearful of Manny’s much slower attempt to attack. The abilities of both fighters start with the foundation, their feet and legs. Everything is built up from there. Old legs spawn things like rope-a-dope. A good coach should teach his students that although it’s basic, good footwork is a critical part of their development. They need to polish their boxing skills from the ground up. Too many mistakenly start by swinging for the fences. It’ doesn’t matter whether you want Money or Pacman to win. You can’t help either one. What really matters is what carries them up into the ring. Their legs. Who’s going to win? To answer that question, ask another…Who still has the better legs, the quicker feet? Floyd’s elusiveness, his counter punching, his sneak right hands, his jab to the body, and so on are only possible because he has great legs. Without them he is ordinary. The same is true with Manny. Without his great legs, there would be no lightning fast attacks, no blazing combinations fired from different angles, no double shift, and so on. A convincing argument can be made that it’s Floyd who has kept the better legs, because he has never been beaten up. In fact, as he repeatedly says, he’s never been beat. Manny is praised for giving the fans what they want, excitement. But, it comes with a price. Manny has been bounced around, cut and rendered unconscious. A knockout loss such as he suffered in JMM IV has got to put a hitch in your giddy up, or psyche. It’s also well known that Manny has had trouble with leg cramps. There’s no such problem in Money’s history. Will that be a factor? Floyd is probably counting on it. However, Freddie Roach says no, that they’ve taken necessary steps in the current training camp to prevent the cramps from happening. The truth will be revealed May 2nd. Manny seems to be the fan favorite, the nice guy liked by everyone, a man who has made it his mission in life to help those less fortunate. That by no means suggests he has a better chance at winning. All the attributes, quirks, and oddities, or even popularity can’t climb into the ring with them. The odds makers couldn’t care less. They know it’s going to boil down to who has the best legs, those legs that carry them up, and through the ropes. It’s those legs that will supply the advantage. 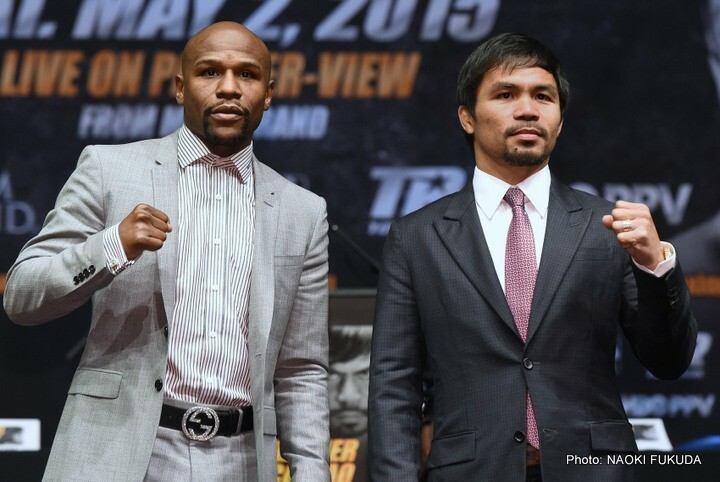 It’s going to take more than Floyd’s shoulder roll, or Manny’s combinations to win the fight. It’s going to be those lower limbs that make up the difference in who gets a leg up and who ends up on his last legs.